Family owned and operated since 1952, Baker Petroleum has spent more than half a century as one of Southern Delaware's leading energy companies. We serve all of Sussex and part of Kent Counties with the dependable delivery of propane, heating oils, diesel fuel and gasoline. We also specialize in the sales and installation of gas fireplaces and energy-efficient hot water heaters. We have 24 hour emergency service, so we are always there when you need us. We offer many payment options including automatic credit card payments, budget plans, pre-buy plans, and a discounted EFT payment option. We are members of the National Propane Gas Association and the Mid-Atlantic Propane Gas Association. We stay up-to-date with industry standards, including technology and safety. No customer is too big or small. We serve residential, commercial and agricultural customers. We also work closely with many builders on new construction. Contact us today. Our professional and courteous staff is eager to serve you. Take Control of your company's fleet fueling expenses with the Baker Petroleum fleet fueling credit card. - Allows you to track by driver and vehicle. - Convenient monthly billing summarizes your fleet’s purchases in one easy to read bill. - Fleet cards can be PIN protected. - The ability to track odometer readings and fuel efficiency of their fleet on a per mile basis. - We manage the credit cards ourselves, so you get local & courteous service. - Cards can be grade restricted to discourage theft. Click here to start using it today! Not a Baker Petroleum customer? Fill out our enrollment form! Let us install your new hot water heater today. 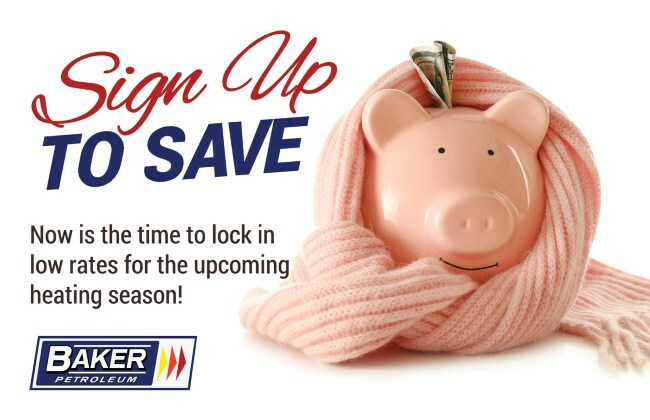 Take advantage of federal tax credits and let Baker Petroleum replace your current hot water heater today! "Baker Petroleum has done an excellent job and the customer service is the best. They have beat the competitors pricing with both this unit and the propane needed for the unit. Answered questions and completed all my needs, arrived when they scheduled for, and cleaned up the minimal mess that was made. Definately recommend this company again." - Rob M.
"Great Company to do business with." - Matt R.
Proudly serving customers in Sussex and Kent County since 1952, Baker Petroleum is a leading Delaware propane and fuel oil service provider. Offering propane, heating oil, diesel fuel and gasoline services to residential, commercial and agricultural clients, Baker Petroleum remains one of Delaware's leading energy companies. Contact us today for more information. Contact Baker Petroleum for propane in Lewes, Milton, Milford, Georgetown, Rehoboth Beach, Bethany Beach & Millsboro. ©2019 Baker Petroleum. All rights reserved. Enroll in a price protection plan today! For additional information or to sign up for this offer, click the image below! For customers that own their propane tanks, please call the office for updated pricing. Who is ready to kick off the summer season with a good old-fashioned barbecue!?! 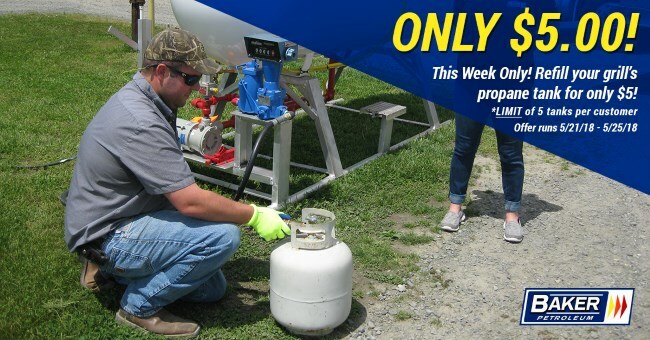 Get ready for Memorial Day weekend by having your propane grill tank refilled for only FIVE DOLLARS! You heard us right, only $5.00 to refill your grill tank! We want to offer YOU the best for less this summer!